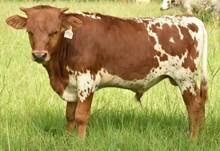 White with red points, speckles and spots. 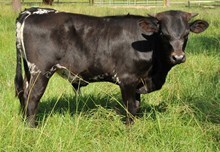 Straight Butler cow with good disposition and confirmation. 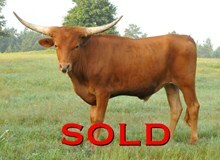 Very traditional-looking longhorn with a beautiful face and nicely-shaped horns. She'll eat cubes from your hand. Artificial Insemination Drag Iron Over 80 inch brindle bull. Big bodied.